The other day, we shared what we saw on Lowes’ website, an announcement that Craftsman tools are coming soon – April 2nd to be precise. Well, it’s April 1st, and some new Craftsman tools just appeared on Lowes.com. As of now, we’re leaning towards the belief that the new Craftsman tools will only be available online, at least for the time being. 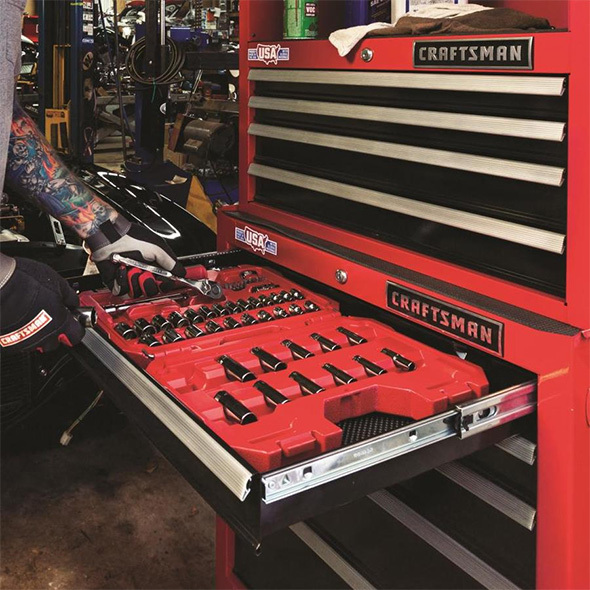 All of the previous announcements indicated that the new Craftsman brand will kick off in the second half of 2018. We’re still a few months away from that, so the new launch will likely either be online-only, or in stores in a limited “teaser” capacity. These tools look a little familiar. Here’s the 118pc set, CMMT82330, priced at $70. 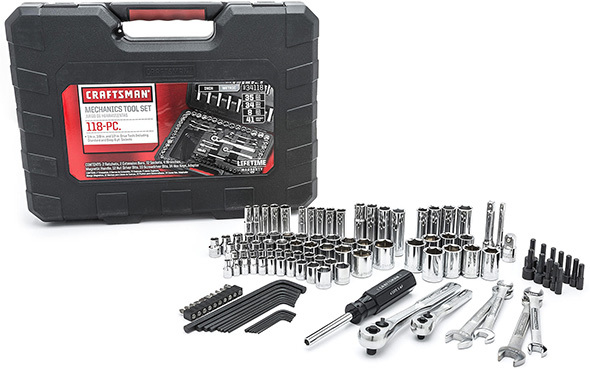 Now here’s the 118pc Craftsman tool set at Sears, currently $45. Are these the same tools? Looks like it to me. This was to be expected – Stanley Black & Decker likely had no choice but to lean on Sears existing suppliers while they get the Craftsman brand fully integrated, and while they worked on getting in-house production set up. I can’t help but feel a little disappointed. 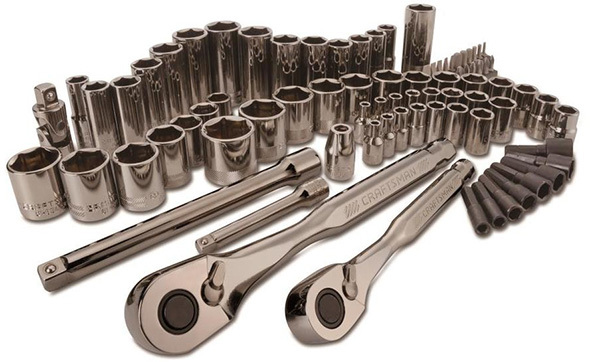 There’s also a new 51pc set, CMMT82334L, with new long-handle 120-tooth full-polish ratchet, is priced at $70. 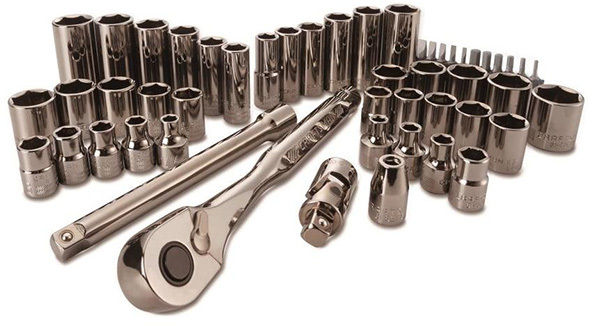 The new ratchet looks sleek. 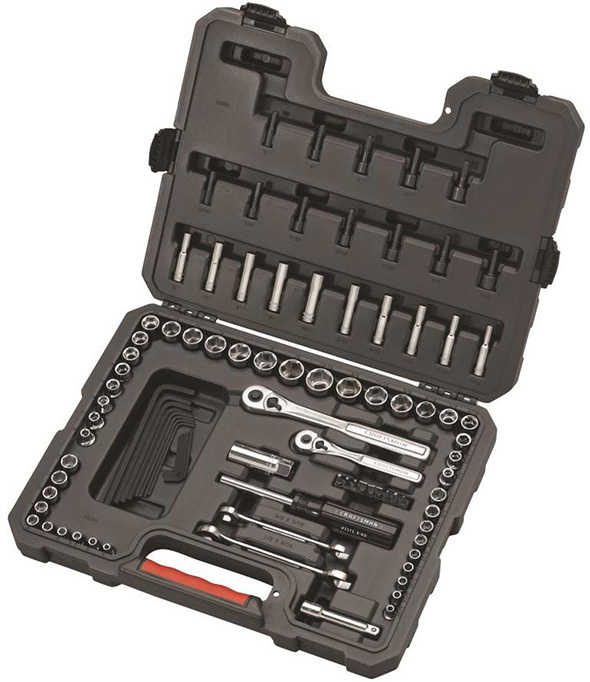 And here’s the 81pc set, CMMT82335L, also featuring 120-tooth ratchets, priced at $100. Here’s a product image of the fold-flat case inside USA-made Craftsman tool storage cabinet. With a little Google magic, I came across a photo of the front of the 81pc set’s carrying case. There’s mention of the gunmetal-colored chrome, the Full Lifetime Warranty, and what looks to be “3X greater access,” which would refer to the high tooth count and small swing arm. Hmm, are these 120 tooth ratchets, or 120 position ratchets? Gearwrench has had 120XP ratchets for some time. 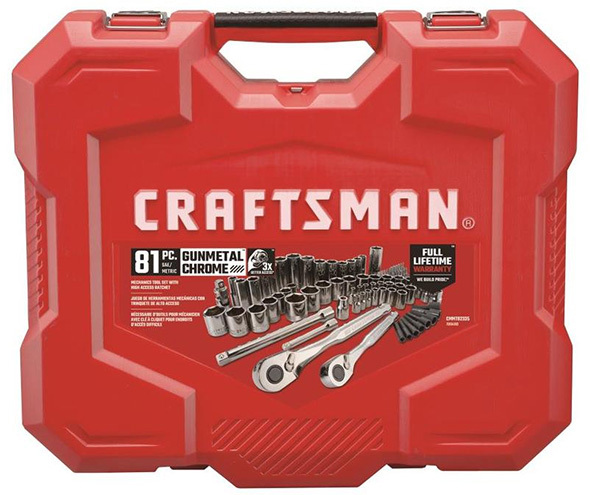 If Apex is supplying Stanley Black & Decker and Lowes with the 95pc and 118pc mechanics tool sets, maybe they designed and manufactured these 51pc and 81pc sets for the new SBD Craftsman brand, too. But WAIT. Let’s not make assumptions yet. Stanley Black & Decker has plenty of hand tool manufacturing capacity, and so perhaps these were designed and produced in-house. Remember, Stanley Black & Decker has multiple mechanics hand tool lines, such as Stanley, Dewalt, Blackhawk, Proto, Mac. Here’s a recently released Stanley 120 position 3/8″ drive ratchet, priced at $20 via Amazon. The new Craftsman 120T ratchets aren’t clones of the Stanley. But I don’t see why they couldn’t have come off the same factory production line. Either way, the Lowes product descriptions mention “120 tooth” too many times. If these do have 120 teeth, that’s a new development. If they have 120 positions by way of stacked pawls and 60-tooth gearing, somebody needs to update the product descriptions. What’s missing on the front of that red tool box cover? “Made in USA.” We can’t see the back, so we don’t know for sure, but I also didn’t see any “USA Made” claims for any of the tools. There’s not one “USA” in any of the product images, at least not that I could see. 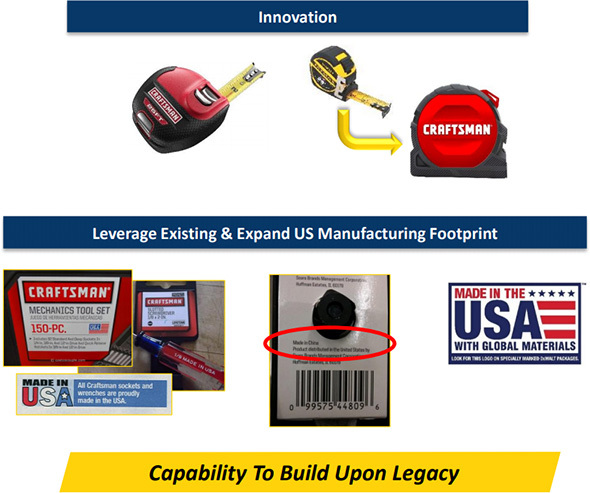 Stanley Black & Decker has made big promises about their return to USA manufacturing for Craftsman tools, at least where possible. Wouldn’t these product images and descriptions have mentioned USA origins of the tools were made here? To be frank, even if these are sourced elsewhere, I won’t make any judgements, at least not yet. Setting up new production takes time, if they want to do it right. Besides, I don’t need a new mechanics tool set right now. For those that are in the market for new tools, how many care about country of origin? Getting something to market now, ahead of Father’s Day, is a reasonable business decision. 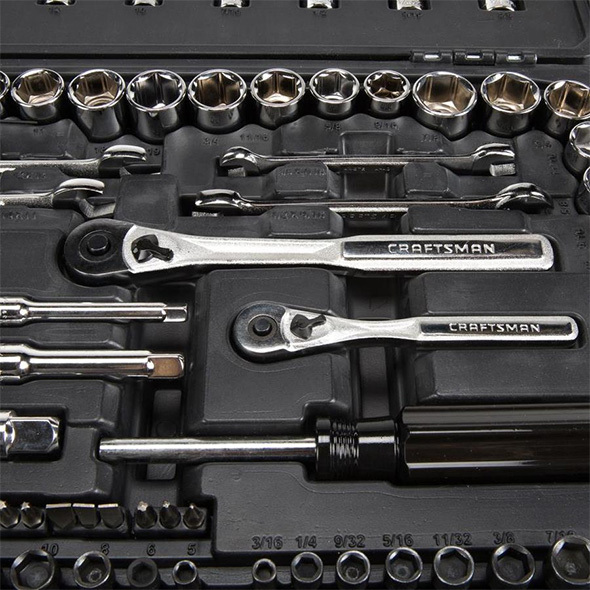 So, as of now, or at least soon – I’m seeing April 26th, 2018 home delivery and “ship to store” estimates – we have 4 Craftsman tool set options. 1 looks to be identical to a Sears Craftsman offering, 1 looks like it could have been a past Sears Craftsman set, and 2 look to be new sets, potentially made by Stanley Black & Decker. Yes, I wish that Craftsman launched with all-new USA-made offerings, but I’m also just really happy to see the ball start rolling. Next, let’s see some of those new 120-position ratchets sold separately! But only if they offer something different from the new Stanley ratchets, such as USA manufacturing origins. 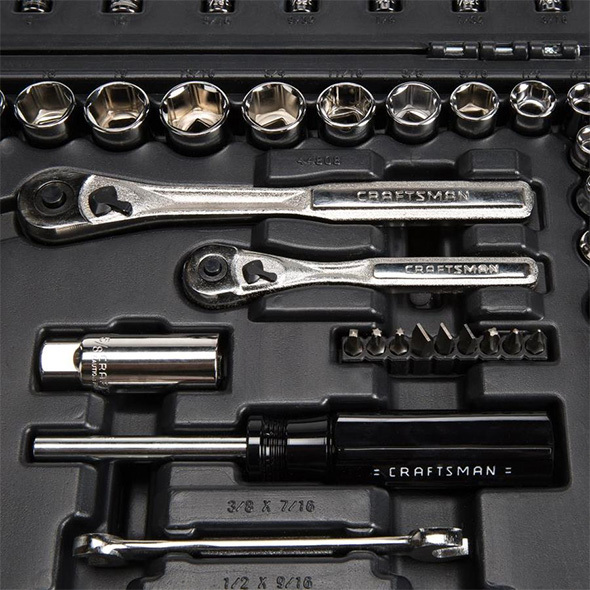 Lowes.com also has listings for Craftsman 137pc and 165pc sets, which also feature “raised panel” style ratchets and old Sears-Craftsman set appearances – CMMT82331 and CMMT82332, but they’re inactive at the moment. Yesterday, I told my wife it looked like Lowes would be releasing made in the USA Craftsman tools on Monday, and to expect a balance on the credit card. Now it looks like my wallet will stay in my pocket. If I want to buy Asian junk and send my money overseas, I’ll go to Harbor Freight. These were made in the USA in the past, and they could be made in the USA now. But if they are, Lowes.com isn’t doing a good job at marketing the tools so far. We won’t know for certain until anyone has these in-hand. Stuart, you do way more research than any of us, is made in USA the most important feature that people look for? It seems to be from what I see, but there are absolutely zero cordless power tools solely made in the USA and people still keep buying them so maybe I’m wrong. It’s something that a small but growing minority of customers are willing to pay extra for. Far more people think they want USA-made tools, or say they want USA-made tools, than the number of people willing to pay the premium. There are some power tools built in the USA. Me: How much did you pay for it? Me: Would you have spent $36 for the USA-made version? I have that 118 piece set from Sears that I bought at a nice discount 3 or 4 years ago. I’m not a mechanic and so this sees occasional use around the house and it’s worked well for my needs. Kind of an underwhelming debut. I think there will be many disappointed people especially if the tools aren’t US made. My question is what is gun metal chrome? Is it the new satin? I own shiny chrome, seen black chrome but, gun metal chrome is new to me. Looks like a darkened chrome but not as dark as black chrome. Idk, if it’s not made in USA then I’m not interested. Too many alternatives. Also, the bigger note I take away from this is the emphasis on the red color. Seems this might be sad capitalizing in Milwaukee’s signature color, which also aren’t made in USA. Well PROTO tools come in red plastic cases.. it’s not that much of a stretch that SBD would use the same color. I can see why you might think that, but red and black are two of the most classic mechanics tool colors. 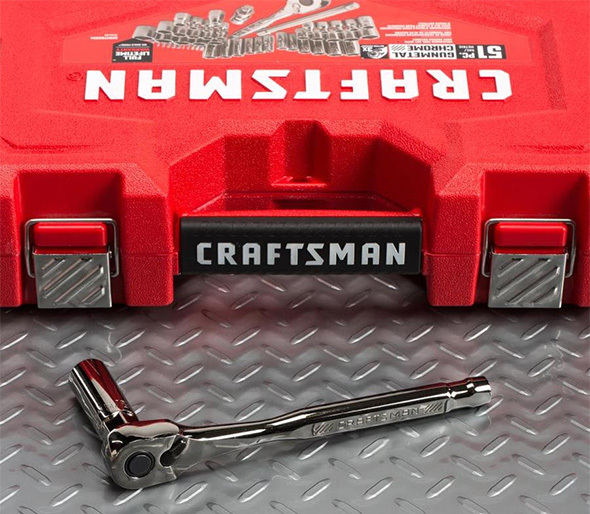 It’s also a color that Craftsman has used for Max Axess tool set carrying cases in the past. It’s also the accent color on a lot of their tools. I have a pile in my garage – from strap wrenches to cotter key extractors, all in red trim. Ditto for their storage. Red and black are Craftsman colors…a lot of their cases are black with red accents on the label (as seen in the first kits) or their packaging. Go look at the Craftsman pro grips on screwdrivers, their clamps, chisels, a lot of their tools. This works really well for being in Lowe’s with Kobalt’s blue cases. I was looking at the Lowes page for the CMMT82335L kit and the live chat window popped up.. so I asked the agent if that kit was made in the USA and their response was that yes it is. I then asked if they had any kind of documentation they could send that showed that and the response I got was: “It’s shown in the box that has been made in USA.” Which I took that as referring to the tool box shown in the pictures… hopefully more information will come out soon. It is an illusion that the people on the other end of live chats are truly alive. Many are dead from the neck up. They read back advertising blurbs to you that you usually have already have seen. They usually have no access to more info. and are often unsble to even comprehend your question. Just my personal experience. That new set is already sold under the Stanley Fatmax line in Canada. If it is the same as the Stanley Fat Max, it is a 60 tooth dual pawl mechanisms. It is not serviceable. If this was Made in the USA it would be at least 10 percent of the graphics on the front. Hopefully Stanley can get “channellock affordability” into their USA made products. I just asked the live chat where CMMT82335L was made and I was told it was made in the USA – here! Did you mean to say second quarter of 2018 or second half of 2018? The second half of 2018 is a few months away but we just started the second quarter of 2018. If you meant second quarter, then the release seems on time. Did anybody else notice that the third photo on the 51 and 81 pc sets had what looked suspiciously like a DeWalt ToughSystem box in red with the Craftsman logo on it? I went and got my organizer out to check, looks darn near identical. I have years of Craftsman tools. I stopped buying Craftsman due to the poor quality and high cost. When Ace hardware took over Craftsman I called them to see if the Life Time warranty would be the same. If I took the tool in would they replace it for free. I was told that I would have to send it back to the manufacturer for replacement. Times have changed and the quality of our products are just throw aways. I won’t buy a Craftsmans tool ever. The demise of Craftsman was predicted by many over the years, including Stu. Slowly but surely all tools will make their way to overseas manufacture. With all the rhetoric these days about outsourcing and the decline of “Made in USA” products that are now made in Mexico, China, India, etc. the following is my take on what, almost, never is addressed and I consider the two major reasons for outsourcing because of their effect on the cost of doing business in the USA. We’re an over regulated nation – back in 2012 THE ECONOMIST wrote an article addressing “OVER-REGULATED AMERICA”. Look it up – it’s a good read. Our government representatives need to rethink many of our burdensome regulations and weed-out, or adjust those that are hampering US businesses. I’m all for regulations that protect the health and wellbeing of workers, but it is a well-known fact that too many of our regulations hurt businesses financially. US manufacturers don’t pay for the costs of useless, or detrimental, regulations – they pass those costs on to the end user, thus raising the price of goods to the consumer and losing their competitive edge against foreign manufactures. America needs a smarter approach to regulation. Smarter would require that all proposed rules should be subjected to cost-benefit analysis by an independent, non-governmental, overseer to assure that business is not unjustifiably burdened with extra operating costs that hinder their ability to compete in the world market. Another reason for outsourcing is the cost that unionization adds to almost every product we purchase today. THE HETITAGE FOUNDATION published an informative article a number of years ago outlining the effects of unionization on this nation – look it up on the web – search for “What Unions Do: How Labor Unions Affect Jobs and the Economy”. I’ve worked in the union shop arena and I’ve also worked in the non-union shop arena. I’ve worked on union controlled job-sites and non-union job sites. My own experience clearly illustrated the fact that when a union is involved in making or building anything in this country the end cost to the customer or end user is appreciably higher. If our politicians were interested in keeping manufacturing here in the USA and assisting American business in their desire to continue producing “Made in America”, while still being able to make a decent profit, they would enact laws so that workers aren’t required to join a union. That move alone would lower the cost of making a consumer product and we the consumer would be better off as a result of it. We ( the people that voted for him) elected a guy that believes in “ made in the USA “ ..he has already slashed regulations and the corporate tax rate. Jobs are plentiful and manufacturing is expanding as we speak. Do you have any facts to support your generalizations? What specific regulations are hampering companies trying to make tools in the US? What specific union-made products cost more than their imported counterparts, and how much more? What union is involved? Do your research – it only takes a little effort and you can learn on your own. If more people would take it upon themselves to study, research and examine the subject rather than believe that everything they read on the web is fact there would be a much more informed public. As for what unions and added cost to products – why do you think so many foreign auto manufacturers that have plants in the US place those plants in the South???? – it’s because of the added cost and problems they are trying to avoid – those companies are better able to compete – the exact point I attempted to make in my original posting. You’re right about one thing – I don’t believe everything I read on the web. Ironically, that includes your post on regulations and unions. No, you’re the one making the claim; it’s up to you to support it with evidence. If you can’t name at least a couple, it’s difficult to take your argument seriously. I think his original comment was completely correct, factually. Regulations do increase cost, as do unions. Paying a living wage, providing a safe work environment, etc, etc, absolutely increase cost. It would save us all a boatload of money if everything was made in sweatshops and the waste dumped out back into the environment. It’s just that doing so also destroys our environment, society, and so on, and some people value those things. All that sound great on paper. I am all for it. Most regulation have been made with well intention. The only problem that I have found is their execution. Honestly it’s very rare for me to see any government doing any well. So between the government and the free market. I choose the free market any day of the week. For example in Texas where I live there is an Franchise tax that only apply to company with revenue exceed a certain value. However we are still required to file a no tax due even if our gross sale clearly fall below the threshold. It’s the same agency. We file our sale taxes quarterly so they know exactly what our gross sale is. So it’s just unnecessary red tape. I am all about paying a living wage, providing a safe work environment. But what about when a union flex it muscle and doing damage to a company because it know it can? What are we going to do about it? Both side should be held responsible and accountable. If we don’t hold both side responsible then it should be no surprise when a company fled to where union doesn’t exist or moved oversea. I am all about holding a company to a higher standard but that also mean we should hold its employee and the government worker whom enforced those regulation to a higher standard. If a regulation can’t be executed fairly and efficiently then personally I think it’s better to err on the side of less regulation and not more. And it really dosen’t take much research at all . Detroit, besides being the former home to the American automaker’s . Well were other auto related industries too . Hello Canada and Mexico , here we come . Use to haul steel to kansaa to be forged into tools , property has got the making of a fine pastoral space. If we strip regulations companies will still sell their tools at the same high price and will only make a larger profit all while polluting the environment more and exposing workers to more job-related dangers. If they weren’t profitable now they would not be in business. The idea that a corporation will pass cost cuts onto the consumers and instead of the shareholders is ludicrous. My thought on union is that once they have exceed a certain size relative to the company then all union member should be forced forfeit all federal employment protection. Union leader whom have found to be abusing their power shall be put on a blacklist of not to be hired, no welfare support either. If that is the case then I am all for union because it put both side on equal footing. Both side need to be held accountable. I am all for employee protection. But that also mean union are responsible to weed out the bad members. Hard working employee deserve to be protected. Lazy and sleezy employee deserve to be fired. Interesting to compare the prices for the “old” sets vs. the “new” line. The new stuff seems to be priced higher than the old stuff, at least on a piece by piece basis. Would be interesting to see a list of what is in each set/sizes ect. I read on another board that the Craftsman call center told someone that the COA was Taiwan. I ordered the 81 piece set and will update yall when I get it. I needed a replacement 17mm impact deep well socket over the weekend. Lowes has single sockets in pull out drawers below their socket sets. The drawers were totally disorganized, so I spent 30 minutes on my knees on the concrete floor sorting the sockets into the correct pockets, and of course they did not have a 17mm. Went down the road to Theisen’s, they carry DeWalt, Milwaukee, and Crescent. Their single sockets were Crescent made in either Taiwan or China. Same size, different manufacturer. I picked up two of the Taiwan sockets. Beginning to think I need to switch to Mac and have the truck stop by work once a month and just pay the price. If Lowes is going to take the place of Sears as my go to tool source on the weekend when IO need a tool they are going to need to radically change how they stock tools. Oh yes, I thought oh cool when I pulled out the drawer. That was short lived as I hunted and pecked! I find that disorganization with fasteners, fittings(plumbing and electrical) and small parts at lots of stores. I usually won’t sort them for them but I often pull out the wrong ones and set them on the floor, or open shelf, where the employees will have to deal with them eventually. A few (smart) stores have bins for odd bits but they are usually woefully small. The new ones look a lot like the DeWalt ratchets. I do hope those images of craftsman tools are made in America, if not I think SBD will see fallout of sales for not keeping their word . A lot of people want to see Craftsman tools made here and at the once great level of quality, they were. Not sure, at those low prices I bet they’re made n chicom. Newer style 81 piece set–$100. They are charging more for the newer style, so maybe they cost a bit more to produce. I just had a chat on the Lowe’s site and they are claiming the sets are made in USA. You’d think it would be mentioned in the description. Take it for what it’s worth with nothing to show it. I’m really interested to check these out. As with several others here, my interest drops to near zero if they aren’t Made In USA. If it’s not American it’s just not Craftsman. Not real Craftsman anyway… I did go into Lowe’s today before I realized it was an online deal only. They really need to get their tool department in order. I love Lowe’s and perhaps part of me is wanting it to replace Sears and give me the ‘Craftsman experience’ that Sears always had. I suppose that’s not realistic given Sears was (once upon a time) Craftsman USA heaven wall to wall and Lowe’s has to carry lots of other brands too. Still, they’d have to either get rid of a few brands to even make room for Craftsman, do a massive expansion on the Tool area, or somehow organize the mess they have to even have a ‘little bit’ of Craftsman. The Tool area is just too poorly laid out and cluttered for any brand to have a decent display. Another thing is Craftsman mowers, snowblowers and outdoor power equipment in general is huge in this area. Nearly everybody I know that owns this stuff owns Craftsman. Even if they aren’t into auto tools or wood working or construction. Lowe’s has a mess of mower brands out in front of the store. I don’t even see how Craftsman would fit into the picture. And do they plan on carrying Kenmore I wonder with our Sears now gone? There’s just so much they could capitalize on if they wanted to. I was a Sears diehard but even I bought our last appliances at Lowe’s since I knew Sears was closing soon. The more I looked at our store the more I realized it needed a complete makeover. The Menard’s across the street has been busy on their makeover and it’s just a better set up which makes it a more pleasant place to be IMO. Out of Menard’s, Home Depot and Lowe’s all within 2 blocks of each other, I’m afraid Lowe’s is probably the worst. They still carry the best lumber but the store layout itself needs to be rethought. It’s just not a pleasant place to shop like Menard’s (or Blaine’s). We have a menards, which is currently being remodeled, nearly across the street from lowes. Then about 1/4-1/2 mile down the road is home depot. Blain’s f&f is about 2 miles away from Menards in a different direction. I haven’t seen any other areas around here that have any two or more hardware, tool or lumber stores particularly close to each other. This lowes has a pretty decent tool dept. I find it a bit easier to navigate them home depot. I think the store is fairly new, probably within ten years. I run the tool department at a Lowes. As for us we’ll be reworking our whole tool department. Thinning out some of the less desirable Kobalt and Porter-Cable tools to make room for a 1/3 takeover of Craftsman. Stuey, I hope you can keep the political and union issues out of this board. Masterforce (Menard’s house brand) sockets, ratchets, and nutdrivers, ball drivers, and screwdrivers were all still made in the US up until recently. They also come with a life time warranty. Menards is neat as they also carry Eklind and at one time Allen (both made in the USA). However, they are starting to phase it out sadly and from what I can tell keeping the price the same. I got this 1/4″, 3/8″, and 1/2″ ratchet and socket set for my dad a few years ago for Christmas and it has held up quite well. I wish that the 1/2″ sockets were 6 pt and not 12 pt, but that is a small price to pay. These run 119.99 normally, but I was able to snag a set for 80 during Christmas. Model Number: MF191176, SKU: 2378030. Note they only recently released another set (that from what I can tell is the same) but it is no longer made in the USA. Model Number: MF191176N, 2379032. Boy they really know this market well. Should sell like hot cakes. Forget about Made in the USA….just as long as it has the word Gun in it…. I also noticed on the Lowe’s Kobalt branded screw drivers that the packaging says made in the US with US and Foreign components. I am guessing the shaft / blade is made from foreign steel? None of the screw driver themselves have made in USA stamped on them, which is a bummer as I really like acetate handle drivers for whatever reason. I have a bunch Made in the US yellow and red Bondhus ball drivers that I have collected over the years and Craftsman screwdrivers that have all held up really well. It’s still some Chinese JUNK!!! That 120 tooth rachet definitely caught my attention, I’m wondering if it’s the same or similar to gearwrench’s dual pawl 120 position rachets (that I very much love) or huskies 120 position rachets or even like the 160 teeth cobra rachets.its kinda of a bummer that it’s not made in the USA or Germany,Japan,Spain or other high end manufacturing country’s. 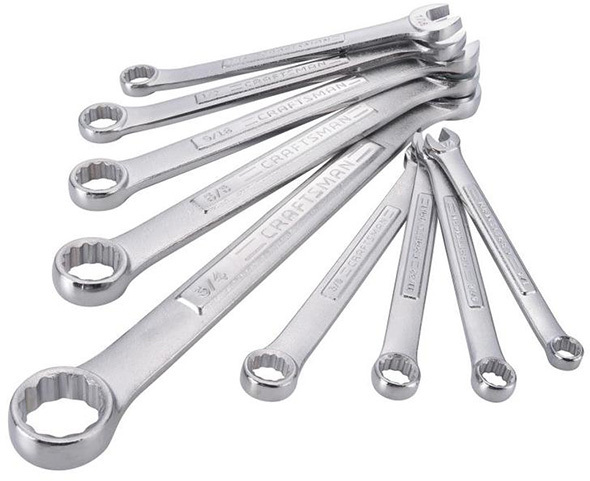 Although Taiwan made tools seem to be pretty decent when it comes to quality.for example gearwrench,tekton,sunex and even big name tool truck economy brands like snap on’s blue point or matco’s silver eagle. I guess we’ll find out once there available,I’ll hold judgement until then. I’ve bought 95% Craftsman tools for the last 35 years, and lately updated some hand tools whether it is made here or abroad the Craftsman tools I have are still solidly built. Also, being that Sears has shuttered one of two stores here in Alaska I applaud the decision to bring Craftsman tools to Lowe’s and hopefully honor the the warranty. I run the tool department at Lowe’s. We started debuting Craftsman today. I didn’t get a chance to Hands-On play with the sets but they were put out and the tool boxes. One third of our department is about to be Craftsman. I agree the debut should have been bigger and better explained. Why don’t they make a USA set and a Taiwan set and see what people buy? For what it is worth, I stopped by my lowes and looked at the different Craftsman ratchet sets. Both the “Gun Metal” sets were made in Taiwan. All the other sets were made in China. I should have linked to that post here. Visited the newest Lowes location here in central AR today, specifically to see if they had a (Craftsman) 3/8 drive ratchet for sale. Nada. Had some sets, boxes, etc but no individual items that I could find. I’m not a mechanic, just a piddler. Looks like I’ll settle for something at Harbor Freight (25% coupon 4th July).